Set within the exclusive luxury community of Bristol Pointe in the eclectic coastal city of Delray Beach, Florida is this truly extraordinary courtyard home. Showcasing breathtaking lake views from every room, this Bristol Pointe stunner offers an impeccably designed main house with over 4,543 square feet of living space including 5 bedrooms, 5.5 bathrooms and a 3-car garage. The upgraded gourmet kitchen is a chef's dream with Sub-Zero and Thermador appliances, an over-sized Boos butcher block prep island, a large walk-in pantry and a Butler’s pantry. The spacious Master suite provides the perfect restful retreat featuring a spa-inspired marble clad bathroom with his & her vanities, a glass enclosed shower and a jetted tub. Additional luxuries found throughout this Bristol Pointe stunner include hardwood flooring in the Master Suite and den, 24’ marble flooring with decorative inlays in main living areas and a formal living room with french doors opening out to the lakeside backyard. Outdoors you’ll find equally impressive features including a freshly painted exterior, lushly landscaped courtyard with sitting area, a fully equipped Summer Kitchen with grill and refrigerator and a heated pool with spa. Just beyond the pool, this Bristol Pointe home also features the rare offering of a detached private guest house which provides additional living space with one bedroom, a bathroom and kitchen area. 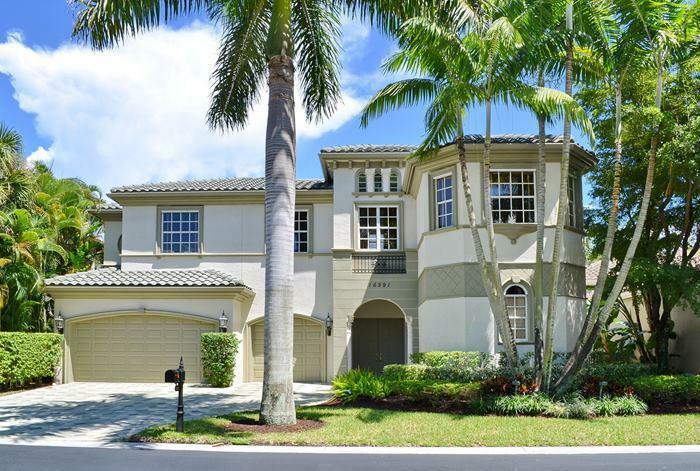 16291 Bristol Pointe is located in Delray Beach and is currently asking $1,299,000. This Bristol Pointe listing is courtesy of Berkshire Hathaway Florida MLS# RX-1014573. Bristol Pointe is a resort-inspired boutique community situated in the vibrant seaside city of Delray Beach, Florida. Residents of this sought after Delray Beach community enjoy an enviable location just moments away from iconic beaches, shopping, dining and nightlife.